Your feet work hard for you – they carry you around day after day. So why not give them some TLC and treat them to an hour break, soaking in a whirlpool of hot, soothing water? 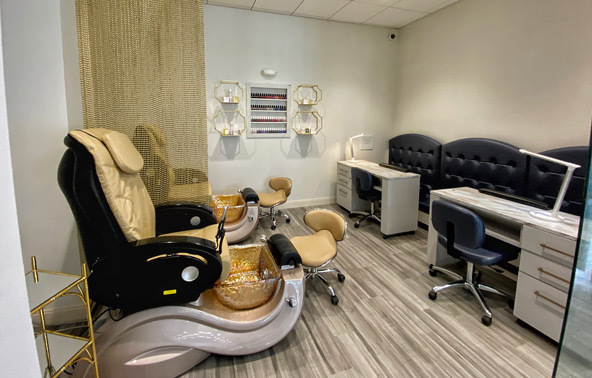 Our professionals cut and file your toenails, clean and clip your cuticles, buff and massage your feet and finish with your choice of nail polish color. Your feet with thank you – they will feel revitalized and softer after we pamper them. Your hands do not go unnoticed and you will feel confident showing off your perfectly-polished nails and smooth, younger-looking hands after you treat yourself to one of our classic manicures. Not only are our manicures relaxing, our service providers are meticulous in their work, promising your nails a clean, crisp finish. All traces of previous nail polish are removed first, and then your nails are smoothed and shaped to your desired length and look. Cuticle softening is used to clean areas on and around your nail bed which in turn repairs and rejuvenates your skin. Any stress you may have will be lifted during your relaxing hand massage, then your nails are painted with the color of your choice. If you want perfectly shaped nails and/or extravagant nail art, this is the option for you. Artificial nails are an excellent alternative to long lasting polish that make your hands look beautiful with long, elegant, perfectly shaped nails. Pamper yourself with extra special treatments during your manicure or pedicure to customize the service just for you. Add special flair to your nails to really stand out – choose from gems or unique designs. Whether you want classic white tips or a pop of color, our professionals will create this timeless design for you. The intoxicating fragrance of Pure Fiji products will whisk you away to the pacific islands in an instant. Sweet, sensual and tropical, the scents are impossible to forget. The botanical ingredients moisturize and nourish skin encouraging its natural rejuvenation process. The trip to the islands may be an illusion, but the silky, healthy skin following applications is a reality. Feel rejuvenated as you dip your hands and feet into a relaxing, warm paraffin wax to smooth and soften your skin. The heated wax opens your pores to release toxins leaving you with relaxed joints and supple, touchable skin. Match your toes to your fingers with this long-lasting and low maintenance alternative to traditional polish.